Hamster has confirmed the next wave of games for its ACA Neo Geo range on the Switch. During a recent livestream, the Japanese company revealed that Magician Lord, Puzzled, Zed Blade, Raguy / Blue's Journey, Spinmaster, and Art of Fighting are all bound for Nintendo's console. Out of that batch, which ones take your fancy? 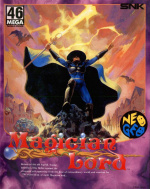 We've got a soft spot for Magician Lord here at Nintendo Life, and Spinmaster is rather jolly, too. Lol, when I saw the thumbnail on the homepage, I thought for a sec this was a new Donkey Kong game. Don't know any of these titles apart from Art of Fighting. Will take a look when they are released but probably fine with my current titles. And still not a virtual console in sight. Pretty sure there are more ACA games on the Switch than retail games at this point. Not a fan of Blue's Journey or Magician Lord. Art of Fighting isn't in a genre I'm interested about either. Zed Blade is a shmup that doesn't look interesting at first glance. Having all these arcade games that I'd never played before or at best a few times 20 odd years ago makes me extremely happy. I'll surely be picking up all of these, except for Art of Fighting and Puzzled. I emailed Zerodiv the other day to thank them for bringing the Psikyo games. I also mentioned a couple of things they could improve and they emailed me back today saying there are updates on the way . I never mentioned adding online leaderboards to them, as I didn't want to sound like I was complaining but hopefully they can be added. I'm down for all of these. Magician Lord all the way. So enjoying all the neo geo releases, even the less popular ones. Keep em coming! @MegaTen Joe and Mac was the first game I thought of when I saw Spin Master and wasn't surprised to see it's made by the same devs, Data East. Zed Blade isn't very good. Everything is just too big and the screen felt very small and cluttered. I will have to pick up Raguy as I have never played it. Not interested in any of these. Having discovered that Zed Blade is a shm'up and one that never got a home release, will probably pick that one up to mu increasing Switch shm'up collection. Hope we see folders appearing soon in the UI. Surprisingly, I'm passing on all of these except for Spinmaster! My wallet is relatively safe for a month...from ACA NEOGEO titles, that is. The Spin Master Arcade version is still exist on my local game Centre, TimeZone ! I looove Spinmaster--I've been looking forward to more of the NeoGeo sidescrollers to come out (there seems to be a lot of focus on the fighting and shoot-em-ups). Sidescrollers were great because the stages would have cool backgrounds and enemies. I miss games like Joe and Mac, Adventure Island, etc. Oh Baseball Stars or 2020 where are you! Do you think these Neo Geo releases are part of the reason nothing has been said about Virtual Console? These are coming out fast and I wonder if internally, Nintendo wanted to delay any VC talk or releases to give these titles the spotlight before the eventual flood of VC releases.......either that or it's just related to the online service not being ready yet. I'm still waiting for the second Samurai Shodown and Last Blade games then. I'm still waiting for the normal arcade games. I only need Mr. Goemon to complete my Goemon collection. @Radbot42 I don't think Hamster being prolific has anything to do with VC. Namco releasing retro games. Zerodiv looks like they are getting in on it. If they are selling then why not. As far as I'm concerned, Virtual Console has begun...there just aren't any NES, SNES games yet. @JoeDiddley Those are the fighters I'm waiting on too. I'm not really interested in Fatal Fury or Art of Fighting. I'm happy with Garou and KoF98 for now. The E-shop desperately needs a separate section for these games. I'm never going to buy any of them, so it's annoying scrolling through them all. I never liked Art of Fighting, there are much better fighting games on Neo Geo. I will definitely pick up Spinmaster and Magician Lord. More Side Scrollin' Beat'em ups are my taste. Still waiting virtual console. And web browser. And Netflix. And way to record gameplay. But atlest we have Splatoon 2 to kill time while we wait. Dear Hamster, please release the regular Arcade Archives on Switch too! 4 out of 5 for me easily. 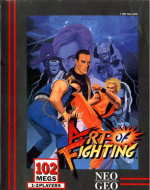 Art of Fighting is a rough sell though with how SNK leapt in design since that game. Unless you are a completionist, needing all the NEO GEO releases, I'd recommend a pass and get AoF 2 or the massive tech upgrade of AoF 3. That's it, keeping scratching titles of the list until Hamster gets to Baseball Stars Professional. I will get me some Zed Blade but the others are not my style. Yes!!! Zed blade is amazing!! I want Windjammers darn it. Always wanted to play Magician Lord. 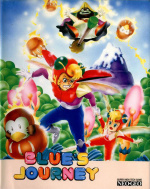 Blue's Journey looks really great, but NL has a retro review that makes it sound poopy. Never heard of Spinmaster but that might be a buy, depending on the review. Puzzled...looks really cool. I already have Puyo Puyo Tetris, but I really like the idea of releasing a character from blocks. Glad to see some variety from the Neo Geo releases. Spinmaster will no doubt be one of the best games to break out for lunch break co-op. If you foresee any chance of roping a random person into this type of scenario, then you should have Spinmaster on your Switch. Nothing else to say other than just trust me. I'll probably get Spinmaster, used to play the hell out of this game in high school when my buddy worked at Shakey's Pizza! Such good co-op! Also, can we please get an official statement from Nintendo regarding VC already? Secret of Mana collection, Namco Museum, and numerous NeoGeo titles are suggesting that almost everyone EXCEPT Nintendo are ready to put old Roms up to appease customer demand... and Nintendo's last word was "NES Dr.Mario in 2018!"... come on now. I'll probably grab all of these. Even Art of Fighting since I have never played it. I honestly believe that the reason why Nintendo has barely made a peep about their VC plans is because they probably realize that they can't simply trot out the same service that they have three times before. I imagine that they'll probably toy around with the prices a bit. Charging $5 for every NES title may have worked in 2006, but it seems absolutely ludicrous in 2017 to charge $5 for Urban Champion, or Excitebike, or Ice Climber. I could see them releasing NES/SNES/N64 titles based on their market value (to an extent). I'm thinking something like $1.50-2 for the B-games (Mario Brothers, Urban Champion, Donkey Kong Jr. Math, etc. ), $2.50-3 for their A games (Punch Out, Startropics, Kirby Adventure, Dr. Mario, Zelda II), and $3-3.50/4.00 for their AAA titles. I'm also sure that we will see some form of Gamecube support at some point, but there is no guarantee since Nintendo could have announced it for Wii U and didn't. I won't pay a dime for games that I've already downloaded, and I'm sure that Nintendo is cognizant of that. At this point, I would reach out to Sega, have them drop this absolutely dopey Sega Forever trainwreck, come back to the VC in a big way (Dreamcast deserves real preservation, and since Sega doesn't know a thing about how to keep their own legacy pristine, allow Nintendo to provide the polish)! Imagine, a VC with NES-Gamecube/GB-DS, Sega Master System-Dreamcast (and that includes Sega Saturn, which was notoriously difficult to program for), the ACA releases, the upcoming Psikyo releases, etc. I would love to see Nintendo reach out to Atari, get the Flashback comps, but go even further by navigating around the trickery of who owns the rights to what, and release the best of the 7800/Lynx/XE/Jaguar libraries! The ultimate VC, in the palm of your hand! Make it worth everyone's while! you mean they are porting things other than just fighting games? I'm glad to see Spinmaster getting so much love, I really love that game, always thought it was very under rated. Played many hours of it in co-op on holidays as a teen, great fun. I just want Soccer Brawl, puh-lease..
Games I want to see on Switch that were Neo Geo Games. I would highly recommend Spin Master very fun game with bright colorful graphics and tons of weapons. @OorWullie how did you find out about all of these great games coming out? Any ideas what Zerodiv are going to be releasing next? Zed Blade looks good. I'll definitely grab that. I'd love to see 8ing / Raizing games get a Switch release. Dimahoo is an incredible shooter. Tiny bit tempted by Zed Blade, if only because the music for the opening level reminds my of early Prodigy; then again I could just play Last Resort or Blazing Star whilst listening to the Experienced album. I would actually like them to divide the Eshop up into categories. I could care less about these titles to be honest. I know there are lots of Neo Geo fans too who would appreciate those games in its own section. 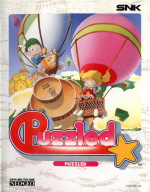 I just want a port of Twinkle Star Sprites. Oh wait you're being serious. I hope you're right because what you've said is what I've been saying for years but I honestly do not think it will happen. Nintendo do not learn and only seem intent on angering its loyalist fan base. I've got fond memories of Art of Fighting. Really! I want wind jammers and body count! @OorWullie Strikers 1945 was a great surprise. I love playing that game using one credit to get the best score. @Lord Wind Jammers just appeared on PS4, does Hamster not have the license for it? Let me know when Sengoku 2 and 3 come. Still no Last Blade huh? @VaderGB That's how I've been playing it too, I set the continues to zero.Ive only made it to the 4th stage once. If you like Strikers then I highly recommend Aero Fighters 2 as well. That has a High Score Mode that's really addictive. @wasilewski I'm not sure what games Zerodiv are bringing next. I'm hoping more will arrive with this weeks download. Going by those last releases they may not tell us in advance and just release them without notice. Any news on the next batch of Neo-Geo titles? Art of Fighting arrives today on the European eShop. Wondering what is coming next and into October? Hoping for Nightmare in the Dark for Halloween among others.